Note: This article is a sidebar to this issue's feature story, "Old but Faithful." She calls herself a "city gal" who emigrated as a child to the U.S. from Leicester, England, where her family owned a large manufacturing company. After a 16-year career working her way up the National Park Service bureaucracy, Mary Bomar is now the agency’s 17th director. 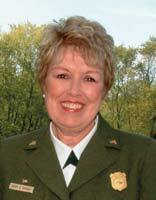 Her experience in the ranks will be "hugely positive" for Park Service morale, says Bill Wade, retired head of Shenandoah National Park and a leader in the Coalition of NPS Retirees. "It has been a long time since anyone from the Park Service ranks has come to the top job," Wade says, adding that career employees have been mostly ignored or intimidated by recent directors. Bomar became a U.S. citizen in 1977, raised a family and traveled this country and Europe with her Air Force husband, working along the way as a civilian military employee managing morale and recreation programs. Her age is, at this point, officially ambiguous. "She declines to give her age, but we think she is 62," is how the Park Service press office responded to a recent inquiry. She got her first top management job in the agency as the superintendent of the Oklahoma City National Memorial for victims of the 1995 bombing. In all, she spent 12 years in the West, traveling to a half-dozen parks and offices and serving briefly as acting superintendent of Rocky Mountain National Park before her four-year stint in the 13-state Northeast NPS region. Wade expects one of her most difficult jobs will be balancing demands from commercial interests with those of park users. "She will have some battles on her hands," he warns. Joy Oakes, mid-Atlantic regional director for the National Parks Conservation Association, believes Bomar is well suited to such challenges. Oakes worked with Bomar on resolving community and business objections to Park Service security restrictions at Philadelphia’s Independence National Historic Park. "Her main contribution was her ability to listen to community concerns and address solutions," Oakes says. At Bomar’s confirmation hearing, senators quizzed her about snowmobiles and bison in Yellowstone, air pollution nearly everywhere, Interior Department ethics and park maintenance, fees and management. But they liked her, and one, Sen. Arlen Specter, R-Pa., even commented on her "smart uniform," saying, "She looks right out of central casting in Hollywood." And in old-boy, congressional style, Bomar was congratulated at the hearing’s end by Sen. Pete Domenici, R-N.M., for "a good job of not answering questions ahead of time." Apparently, he meant she’d been smart not to reveal her thinking before being confirmed by the full Senate. But he added, "There are many serious issues right in front of you that must be resolved and have been put off. They won’t be put off much longer. You’ll have to get on to solutions to most of them." According to the Casper Star-Tribune, Bomar continued to speak generally during her first post-appointment trip to the West, telling an audience that included state tourism leaders she was concerned about a leveling off of national parks visitation. She said the parks need to attend to the changing demographics and technological expectations of park "audiences." She repeated priorities she’d mentioned during her confirmation hearings (re-engaging the public with national parks, increasing the parks’ capacity and developing new Park Service leaders). And she obliquely mentioned an issue that came to dog her predecessor, saying her number-one goal includes a focus on the National Park Service’s traditional mission of preserving national parks "for future generations."